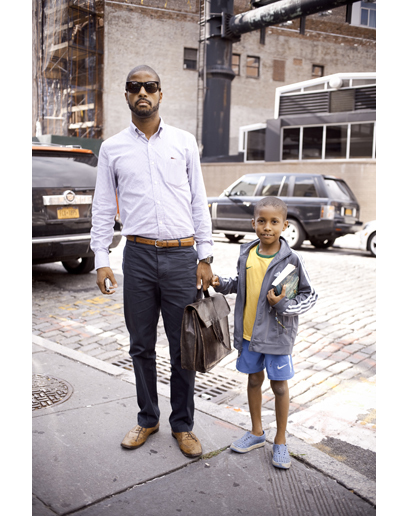 This Father and son pair wear preppy well. The toddler looks like a little scholar in his collegiate inspired button up sweater. I never knew I could love a slouch hat so much on a toddler. Love this look, my eyes are having a party! Perfect combination of print, color, and texture. Big chunky scarves are the best accessory for the cold weather. They can add that texture & color, while also keeping you warm. Benjamin King Steven Alan sweater, Northface down coat, Uniqlo corduroy // Arlo King Gap Parka, VANS fire shoes // Alby King star beanie, baby legs. Neil Levis, Banana Republic leather jacket, Clarks boots // Shea Neff skull cap, Levis, Uniqlo jacket, Adidas shoes // Rosy cutest dog ever. This crew is all about the attitude. Neil is a sound designer and composer for film. Check out Neil's website: www.BrooklynSoundSociety.com Shea plays the tenor sax, piano, and drums. Love this father/son pair. I mean the briefcase and the book...This Dad is rocking Lacoste & a great Business casual look. The larger sized shaped shades add a nice edginess. The son's sportswear is on point with all Nike, matching his sports brands (extra points). Its that time of year...Hat weather! Bring on the beanies and the beards. The cross stitch accent on the hat makes for a nice detail. Accessories can elevate a simple casual day look & stand out in the crowd. Dave Bassike shirt, Nudie jeans, Topheads "Topseye" bamboo sunglasses // Lyla Witcherie Kids, Country road, Haiti vintage sunnies // Frankie May target, GAP kids. Dave and his family are from Bondi Beach, Australia & are rocking Aussie brands. Dave and his wife Kendall just started a great company "Tummy Love"-trust your gut, which aims to heal the world through food. A pop of color, grounded in neutrals go a long way. Simeon vintage tee, Tokidoki hat & Jordan 8's shoes // Sasha & Sadie printed and denim leggings. A big smile is the best accessory. Scarf love, hat love, bag love. Dante Lee Rider jacket, American WW11 chinos & redwing boots// Rocco French Bonton jacket, Gap kids chinos.